Sending gourmet cookies by mail is a thoughtful gesture suitable for a variety of different occasions. Many retailers bake cookies daily and ship them quickly to ensure optimal freshness. You don't need a reason to send gourmet cookies by mail. They make lovely gifts and show those dear to you that they are in your thoughts. Add to the experience by taking time to consider the types of cookies and the types of presentations available. Many retailers offer delicious options to consider and you can find the perfect selection with a little effort. Some recipients may enjoy traditional recipes with no frills and others may prefer unusual recipes. Arrangements include visually appealing assortments in artful displays. Many cookie connoisseurs agree that the best cookie recipes have been in circulation for generations. Many retailers offer cookies by mail made with traditional, no-fuss recipes. Cornerstone Cookie Gifts offers a handful of old-time favorites packaged in a variety of reusable and disposable containers. Enjoy old favorites like chocolate chips, oatmeal raisin, peanut butter chips, and more. David's Cookies are baked fresh and delivered as soon as possible. The company uses quality ingredients, and each cookie is made from scratch. Like Blue Ribbon Baker, David's Cookies come in just a handful of flavors. You can also buy cookie dough from the company for freshly baked cookies anytime. Some companies that offer gourmet cookie deliveries feature unusual flavors that add interest and surprise to the treat. Unique recipes from Blue Chip Cookies Direct offer delectable twists on the dessert favorites. Shoppers can find flavors like cappuccino, almond and toffee and many others. Carolina's Cookies includes traditional recipes, but many have unusual ingredients like oatmeal cranberry nut. The company offers sugar free varieties and a cookie of the month club for those who want to try an assortment. Stellar arrangements are very appealing to many and some companies offer beautiful selections. The gourmet cookies by mail offer the added enjoyment of visual appeal and many come in reusable containers or cookie jars. Gourmet Cookie Bouquets have gorgeous presentations and decadent recipes. These gourmet gifts are as pleasing to the eye as they are the palatte. The company's catchphrase is "a smile in every bite" but the very sight of the arrangements is enough to conjure a smile.The Deluxe Oreo selection is stunning, with designs that run the gamut from wedding themes to adorable smiley faces. Many products are available with free personalization. Other selections include giant fortune cookies, birthday themes and children's designs. Many of the designs are similar to ones you would find on gourmet cakes and pastries. 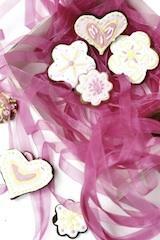 Profound attention to detail and imaginative designs make Gourmet Cookie Bouquets' website a splendid place to visit.